Green New Deal forum at the Albany Public Library. In February, New York Congresswoman Alexandria Ocasio-Cortez and Massachusetts Senator Ed Markey introduced a Green New Deal resolution: a set of proposed economic stimulus programs to address climate change and racial and social economic inequalities. 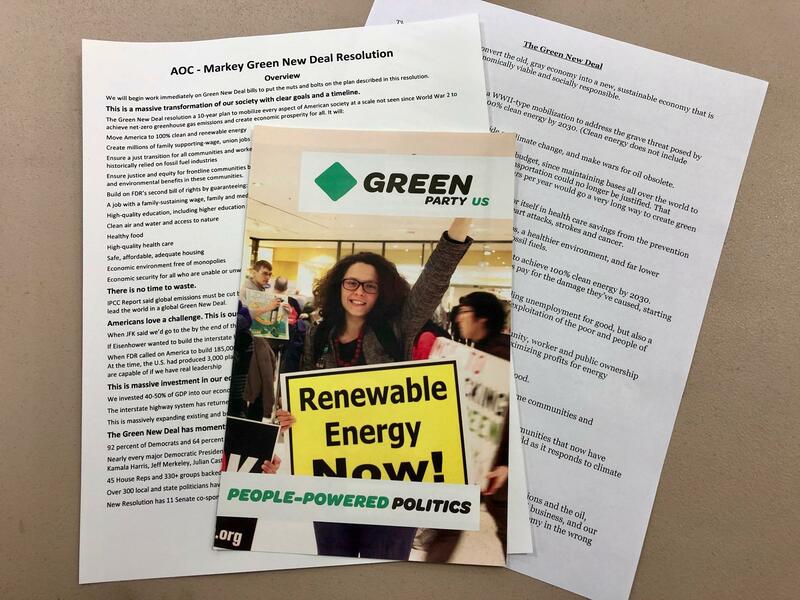 Over the weekend, about 100 people attended a Green New Deal forum at the Albany Public Library. The Green Party's Howie Hawkins is widely viewed as the first candidate for public office in the United States to promote a Green New Deal during his 2010 gubernatorial campaign in New York. At the forum, Hawkins painted an apocalyptic picture of the near future. He warned based on the amount of carbon being released into the atmosphere "we have six and a half years of carbon budget left" before temperatures rise and arctic ice melts. "At which point, we're basically cooked, literally. What this crisis means is mass extinctions and eco-systems collapse, the end of agriculture that can feed the population we have, widespread poverty, social conflict and wars for what's left. And that's by 2050. With ocean acidification and the destruction of vital plankton, which provide two-thirds of the oxygen in the atmosphere, we're facing basically suffocating to death by the year 2100, according to some scientists." Now that the GND is getting a lot of attention as a potential prevention program to avoid catastrophic climate change, it is important to note the contributions of the Green Party of the United States (GP) to making the link between the GND, climate change and the U.S. imperial agenda. Howie Hawkins, an ecosocialist, ran for Governor of New York with a GND in his platform starting in 2010, and the two Presidential campaigns of Dr. Jill Stein, which brought the vision of a GND to the attention of millions, made a significant impact. The GP’s GND includes cutting the military budget and ending the imperial U.S. foreign policy which is in utter contradiction to the agendas of both the Republican and Democratic Party leadership. Howie Hawkins, one of the original architects of the Green New Deal, speaks at a forum in the Albany Public Library on Sat. March 9. First of three segments by the Hudson Mohawk News Magazine. The United Nations announced a Global Green New Deal in 2008. Former President Barack Obama added one to his platform when he ran for election in 2008, and Green party candidates, such as Jill Stein and Howie Hawkins, did the same. Howie Hawkins Note: The myth of the Obama Green New Deal has made it into the media over that last few months without any reference to when he might have said anything about it. I can find no contemporary statement by, nor can I remember, Obama calling for a Green New Deal in 2008. He did talk about clean energy as a job creator and economic stimulus to get out of the recession. But Green New Deal was not in any statements on Obama's website nor in the Democratic Platform, which Obama as the nominee had final say so over. ...the Greens must field a 2020 candidate and campaign focused on obtaining national ballot access and building strong, viable and sustainable state and local parties. Howie Hawkins, the longtime UPS worker and union activist who was the NY Green Party’s gubernatorial candidate the last two times around is one of the party’s OG, i.e., Original Green founders. He’s been the most persistent and persuasive advocate of re-imagining the Greens as an independent party with a dues paying membership in the thousands and tens of thousands in every state . That’s what the Socialist Party had up until the Wilson administration took away their free mail privileges at the beginning of World War 1. There are proven organizing models out here, cheap but not free. Billionaires and foundations won’t pay to initialize or to sustain them. They have to be organized and funded from the ground up. Some Greens, namely Howie Hawkins, have accused the congresswoman of appropriating the Green New Deal — a bold new plan introduced by Ocasio-Cortez that calls for the U.S. to run on 100 percent renewable energy by 2030. "A lot of people think [Ocasio-Cortez] thought it up," Hawkins told The New Republic. "But I'm the original Green New Dealer." HAWKINS EYES PRESIDENTIAL RUN — POLITICO’s Marie J. French: Howie Hawkins, after his third gubernatorial run in New York and retiring from his job loading trucks, has bowed to what he called an "underground 'Draft Howie'" movement and is working to form an exploratory committee for a potential 2020 presidential campaign. "It took me a couple months to get my head around the idea of doing it," Hawkins said on Friday. "I've run so many times and it's not like I'm looking to run — it's people asking me to run." Hawkins is a Green Party stalwart, a self-described "eco-socialist" and helped develop an aggressive Green New Deal before Rep. Alexandria Ocasio-Cortez ever ran for elected office. He said the focus for his campaign would be similar to what he's worked on in New York: building up local Green Party membership and training organizers, pushing eco-socialist policies into the debate and preparing a "political home" for progressives disillusioned with the Democratic Party. "Our assumption is Democrats are going to get power back on the national level but they're going to disappoint progressives," Hawkins told POLITICO. "Hopefully, we'll build a political home so when they're ready to come, we're ready for them and able to incorporate them and their energy. That's why it's so important for the Green Party to get better organized." Read more here. Currently the Democrats two marquee issues in the 2020 elections came from the Greens — Medicare for all and the Green New Deal. The Green New Deal began to be developed a decade by the Global Greens and the first candidate to run on a full-fledged Green New Deal was Howie Hawkins in New York. Jill Stein ran on the issue in both her presidential campaigns as have many Green Party candidates throughout the country. See New Republic Gives Green Party Credit for the Green New Deal. It has now been introduced by Democrats, in a weakened form, and continues to be pushed by people’s movements and the Green Party. This week, Hawkins has told the media he is setting up an exploratory committee to seek the Green Party presidential nomination. See Hawkins Announces He Is Building An Exploratory Committee. He looks forward to differentiating the Green New Deal of the Green Party with the weaker version the Democrats are considering. With regard to single payer healthcare, improved Medicare for all, this was an issue put on the electoral agenda by Greens in the 2000 campaign of Ralph Nader and has been part of the Green Party platform since it became a national party in 2000.